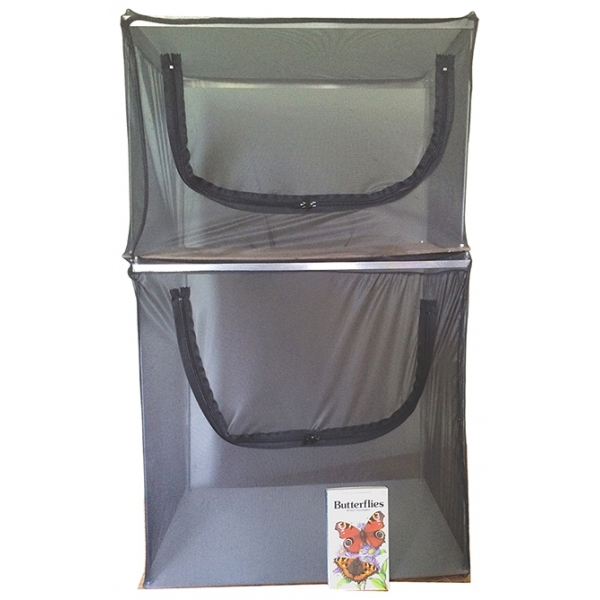 This large cage is ideal for breeding larger butterflies and moths, keeping larvae of the Giant Silkmoths and Hawkmoths, or for larger numbers. It is slightly larger than the former Large (which was 50 x 38cms). It is ideal for keeping other insects such as Phasmids. With this cage you get a lot for your money! 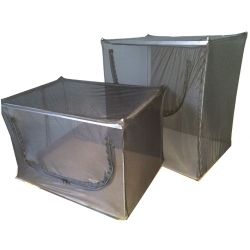 The cage comes with both high and low supports (60 cm and 40 cm) so its height can be selected according to your choice, both initially and at any time in the future, to suit your changing requirements. The cover is designed to be used for either height. An additional base is included as a spare. At any time, if the base has become marked with use, the spare can be used to make the cage as new again. The original base can be cleaned and re-painted ready for the next time needed. Your used cage can be made like new for very little effort, and no cost. You get almost two very large cages for the price of one. This cage is less than twice the price of the Standard PJ Cage but more than twice the volume, and it has the versatility to use it as a high or low cage. STORES FLAT when not needed out of season.